Guys!!! These cookies are perfect for such a romantic day. I love romantic traditions and any excuse to celebrate the love for my husband makes me very happy because I dreamed of a marriage like the one we have. Oh and since he is gluten free and loves cookies it’s a perfect recipe! I am so excited for this one!!! I also dreamed about creating a gluten free bakery chunky chocolate chip cookie with simple ingredients. Almost like a single serving or a small portion recipe because let’s face it, we need a quick simple killer recipe we can make ASAP that really stands out. I love bakeries and every time I go I think why don’t they have a “healthier” cookie that is gluten free and has less sugar? 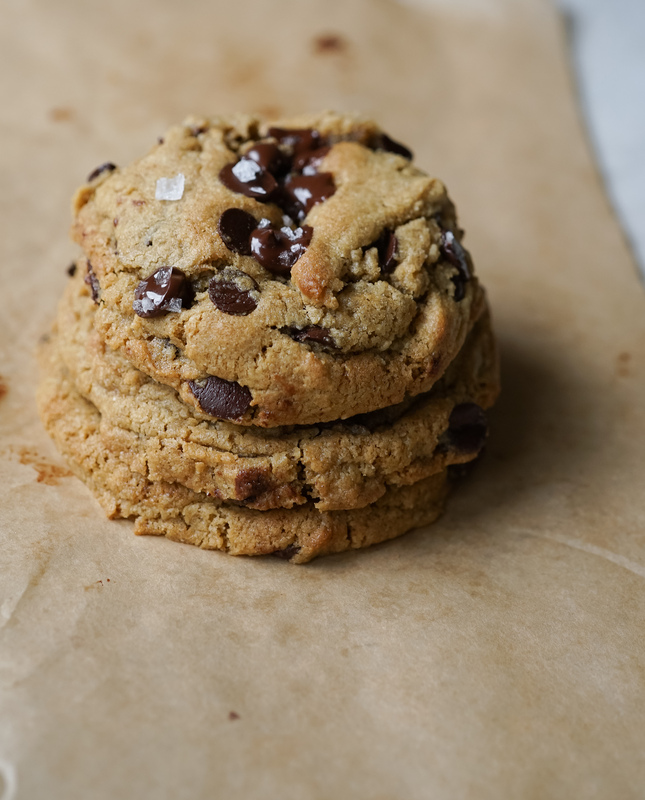 Now this is my indulgent cookie because it does have some brown sugar (not a lot but it needs it to create a chunky chewy cookie. And since we are celebrating a special day and it’s once a year: let’s splurge! 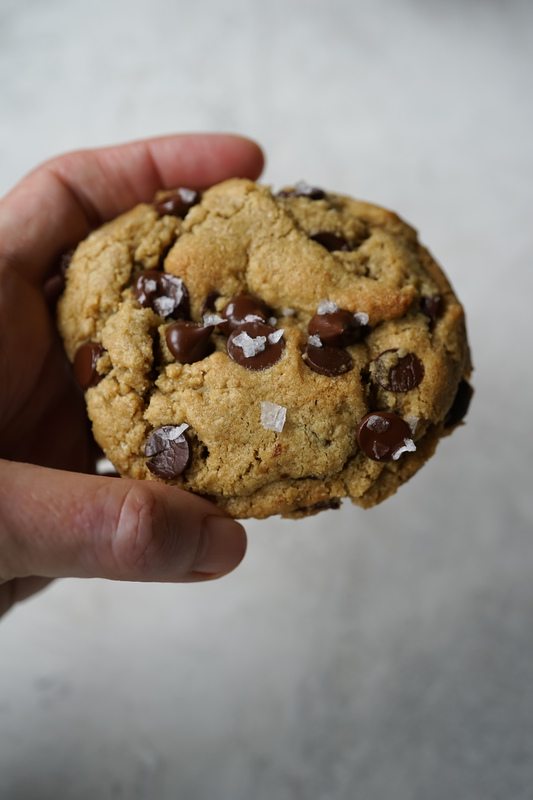 Creating this recipe really was challenging because when I was asked by The Teff Co to create a special Valentine’s Day recipe and I immediately gravitated towards chocolate chip cookies (kind of the NYC bakery style) and I craved these cookies so much I said YES! I LOVE their ivory teff flour !! Little did I know it would take me 6 recipe tests to make this happen, and boy am I glad I did! This recipe is sponsored by The Teff Co (I love this company and their products are amazing) thanks for supporting the brands I love! All opinions are my own! I am soo excited to share with you all I have learned baking with Maskal ivory teff flour! I love the flavor notes, how healthy it is and how it blends really well with almond flour. It is a great ancient grain gluten free flour that adds smooth, earthy notes to baked goods. I see it like the new quinoa (it tastes way better than quinoa or amaranth!). Here are some of the health benefits: high calcium content, with a cup of cooked teff offering 123mg, about the same amount of calcium as in a half-cup of cooked spinach. Teff is high in resistant starch, a newly-discovered type of dietary fiber that can benefit blood sugar management, weight control, and colon health. It’s estimated that 20-40% of the carbohydrates in teff are resistant starches. A gluten-free grain with a mild flavor, teff is a healthy and versatile ingredient for many gluten-free products. Chunky chewy cookies!! And they are gluten free (no gums, no starches, no nut butters, lower in sugar than most recipes), easy to make, short simple ingredients. You would never guess they are gluten free! And this is a small portion recipe which let's face it it's brilliant! I love to bake my cookies on a perforated tray with a Silpat and using a Baking Steel underneath bakes these better. Check out the products in my shop. In a large bowl: with a whisk: mix butter, brown sugar and vanilla to combine (don't whisk to much or the cookies will spread). Add egg yolk, mix well. Add flours, baking soda + salt. Mix until combined.. With a rubber spatula fold in chocolate. Shape cookies with a large scoop and put onto the baking tray (don't flatten) and freeze for 1 hour. Pre heat oven to 350 F. Bake frozen cookies for about 8-10 mins until golden brown and crispy on the edges. Remove from the oven and sprinkle some Maldon Salt on top. Let cool and remove cookies with a cookie spatula. Cool on a perforated tray with parchment paper. They keep well for about 3 days stored in an acrylic container such as a recycled pre washed salad container. These cookies look amazing. Perfect V-Day treat for my two loves. My son will be especially appreciative. Gracias, Vane! Looking forward to trying out Teff ivory flour. Hi Mayra! Thank you hope you love them. Happy Baking! Perfect texture, not too sweet. Thanks for your message. If you can read in the blog post I talk about the nutritional benefits of using Maskal Teff Ivory flour (high protein, high calcium, resistant starch (good for the gut), easy to use in combination w/ almond flour (no need to add a ton of other high starch flours that most gluten free baking requires), bakes really well, tastes amazing, if you click on the other recipes linked on the blog post I talk more about the benefits (health and bake related). I would encourage you to try it or come to a class and learn all about it that is when you FULLY understand an ingredient and it’s taste, function, application and benefits. Hey Buddy!, I found this information for you: "BAKERY CAFE CHOCOLATE CHIP COOKIES". Here is the website link: https://www.vanessamusi.com/bestglutenfreechocolatechipcookies/. Thank you.